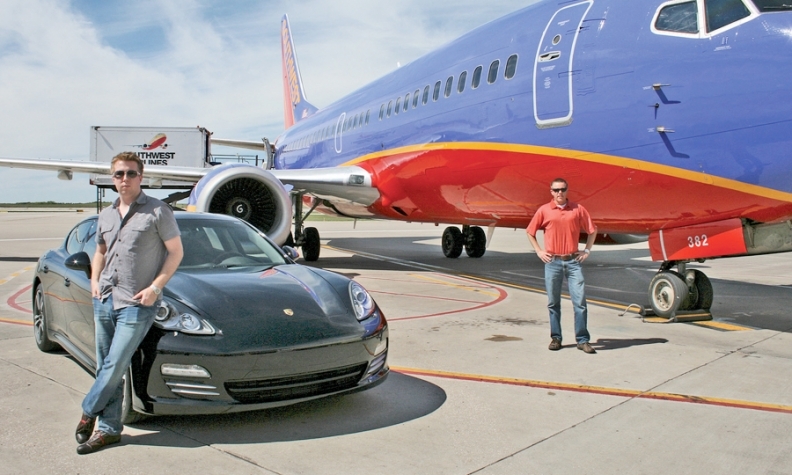 Soave Automotive Group's Kris Nielsen, left, and Justin Meyer, then social media manager for Kansas City International Airport, generated huge social media buzz from their 2011 Race Across Missouri between a Porsche Panamera and a Southwest Airlines jet. When Kris Nielsen received a tweet last winter declaring that cars are useless compared with public transportation, he couldn't let it pass. After all, Nielsen manages social media efforts for Soave Automotive Group, a luxury dealership group in Kansas City. The tweet came from a local public transportation advocate, who -- like Nielsen -- is active on social media outlets such as Twitter and Facebook. So the two hatched a face-off. Nielsen would drive a car and his Twitter challenger, Matt Staub, would take the train. The first to get from Union Station in Kansas City, Mo., to Millennium Park in Chicago would win. For Soave's Aristocrat Motors in Merriam, Kan., the race offered the perfect opportunity to highlight the Jaguar XJL's all-wheel-drive technology. It also was a chance to leverage social media, a growing priority for the dealership group. Dealerships: Mercedes-Benz of Kansas City, Mo. ; Aristocrat Motors in Merriam, Kan.
"We needed to play in that arena, but we weren't going to do it unless we had the right focus and the right person to do the work," Soave COO Kevin Killilea said. "Compared to other dealers, we were probably a little bit slow to have a Facebook page and Twitter account because we didn't want to just have it and not effectively use it." But since hiring Nielsen in 2011, the Soave group has been involved in some unusual promotions that have attracted large Twitter followings. It's hard to quantify how the added attention translates to sales, but the events have generated buzz among customers and community members. The car-train race this year, in particular, showed the power of social media. The parties didn't inform Amtrak about the Feb. 1 race, but they tweeted about the challenge along the way that day. Nielsen had a sidekick with him to tweet; he also was prohibited from speeding. When Amtrak officials learned about the race, they set up Staub in a private train suite and retweeted the messages. Fast-food purveyor Jimmy John's also got involved, arranging and tweeting about a lunch delivery to Nielsen's Jaguar at a fuel stop along the way. "All these brands saw all this commotion going on and jumped on board and amplified the message in a way we couldn't even have remotely predicted," Nielsen said. "For a local automotive dealer, having a national brand talking about your product -- that's something you can't buy or arrange." On Twitter, the race scored more than 200,000 impressions -- or the number of times it appeared on a feed, without necessarily being clicked on -- and attracted 325-plus tweets by more than 50 people, Nielsen said. All day, Twitter designated the tweets flying back and forth as a trending topic in Kansas City. On Facebook, Aristocrat gathered more than 100 likes, while Amtrak's posts drew more than 1,000 likes. Facebook impressions totaled more than 25,000. But did it result in sales? For Killilea, that's the million-dollar question with social media. And it's tough to answer. "All we're trying to do is extend our reach with this stuff," he said. "It would be great if we could translate everything we do to a car sale, but we know that's not realistic." Nielsen: Cool factor pays off. Nielsen says making sure such events have a cool factor will pay off. The 25-year-old joined Soave, owned by Detroit business tycoon Anthony Soave, with a background in social media and the auto industry. His parents have managed dealerships, and Nielsen worked on vehicle launches for Mazda North America as an intern. When he started at Soave, Nielsen set up Facebook and Twitter accounts and studied what other dealerships were doing. Few promotions seemed social in nature, he said. Photo caption contests and iPad giveaways were more common. Nielsen aimed to be different. After all, Killilea had charged him with appealing to the wider community, beyond the car geeks who want photos of the latest Porsche or Jaguar. In September 2011, Nielsen raced something bigger than a train: a Southwest Airlines jet flying from Kansas City to St. Louis. The Race Across Missouri was prompted by a Twitter discussion on whether it was more efficient to drive or fly for a short trip. Nielsen arranged to race the plane driving a Porsche Panamera. The event trended on Twitter in Kansas City and St. Louis. Local newspapers and TV stations covered the event. Southwest Airlines, Porsche and Kansas City airport officials tweeted about the race. Twitter impressions totaled more than 300,000, Nielsen said. For a cost of about $1,000, the event got a lot of people talking about the dealership group, he said. For Killilea, the attention such events has attracted underscores the importance of having a dedicated social media manager who is engaged with the community. While there is a salary cost associated with that, Soave's overall marketing budget has shrunk as the group has shifted its resources from traditional media to social media and digital marketing. Newspaper advertising has dropped from about $500,000 annually to $50,000 in just the past few years, Killilea said. And though results vary, the number of people following events such as the train and plane challenges is more measurable than those paying attention to traditional advertising, he said. "If we got people talking about us for some reason, and it's not in a negative way, that's a pretty good opportunity," Killilea said. "It puts our business name and our brands at the top of somebody's mind when they think about buying a car." Oh, and who won those races? Call it a split: Nielsen beat the train, but lost to the plane.